Notes: I'm not sure when I first became aware of this book, a 1902 collection of University of Edinburgh lectures looking at religion by an American psychologist. Especially as this pre-dates Freud and Jung's influences upon psychology, and as the topic of religious study is one of interest to me, I'm hoping to enjoy this quite thoroughly. It seems to me that perhaps author John Gardner mentioned this book in his On Moral Fiction, so maybe that's how I first became aware of this book. Mini review: An interesting read. Dated in many ways, but also still quite appropriate to our modern age. The author's conclusion leans toward there being something to religion, but he's not quite sure what it is. This is a book by a scientifically-minded man who still feels a yearning for the extra-worldly, and it seemed obvious to me these two aspects were somewhat in conflict within himself. Here he is presenting a professional series of lectures, and he goes through quite well what constitutes religion and makes it important. The focus here is upon religion on the personal level, not socially and political. Worth your time to read if you have interests in such subjects. Despite the age of this book, I found it a pretty easy read, though I did feel the author was stronger when studying and describing various aspects of religion and psychology than he was in the final lecture or two when trying to make his final arguments. One interesting aspect, at least for myself, was the author's arguments that scientists shouldn't become too distanced from their subjects of study, in this case being religion, but should recognize that their subjects have not only an objective sense but a subjective one. That was a new train of thought for me. The above artwork is titled Saving the Best for Last, and it's by artist Daniel R. Horne. It is by far my favorite of every piece of fantasy artwork I've ever seen. To be honest, I'm not real sure. But I can speculate. Looking at this painting as an individual piece of art, there is much I love here. The realism, for one. The colors are muted, which is something I appreciate considering the subject matter and the placement of the scene in a wintry forested mountainous region. There's also the fact there is a lot going on in this painting, and it might take more than one viewing or at least one longer viewing to take it all in. At first glance, this is a somewhat typical fantasy scene reminiscent of covers of Dungeons & Dragons books from the 1980s and early 1990s. But one thing that stands out is the protagonist is female, which was until relatively recently unusual for action-oriented fantasy art, and this particular female is not clad as nor appears in any guise as the more traditional damsel-in-distress nor as the chain-bikini-clad love slave common in fantasy art of the 1960s and 1970s. Represented here is obviously a woman of action, as evidenced not only by her use of the bow, which could simply be a hunting tool instead of an adventurer's weapon, but also by the existence of the sword in her enemy's side; admittedly, the sword might not be hers, as I see no evidence of a scabbard upon her, but her quiver is empty and her opponent has several arrows lodged within his undead form, which leads me to believe our protagonist has been at combat with this particular foe for at least some little time, perhaps only a few minutes or perhaps as long as a day. But this female appears somewhat like a ranger, an adventurous hunter, with her use of a bow and her lack of armor in favor of more rustic garb. Considering the location of this artwork, far from civilization, it would seem this woman set out intentionally to hunt down this monstrosity that now attacks her. Or perhaps she simply ran across this beast while traveling colder climbs, or while hunting deer or some other animal. But the existence of a magical arrow, and her last arrow is obviously magical because of the golden glow around its head (something I did not notice for years), there is evidence this woman is not simply out to provide food for her kin or whomever. This is a woman at least somewhat expecting, if not familiar with, magical opponents. 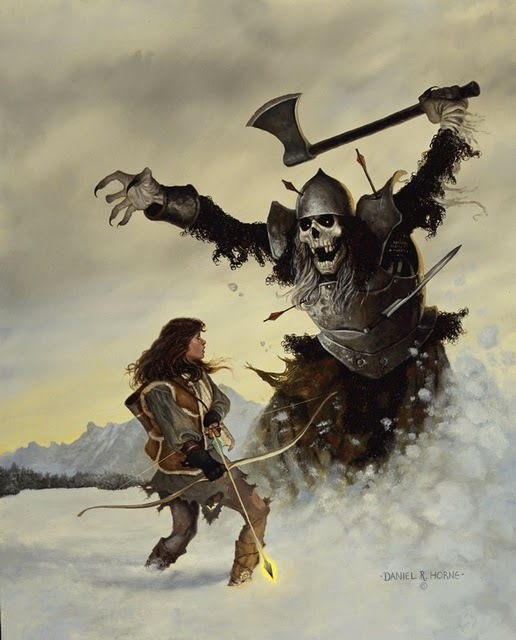 The opponent here, perhaps some kind of winter wight, seems to explode from the snow, as if he were awaiting this female from ambush; but the sword and arrows impaling him and the fact the protagonist's quiver is empty lends credence to the idea their confrontation is not new. This make me think this has been an ongoing battle between the two, one that has possibly ranged over some little distance and some time, which the wound to the woman's leg also lends evidence of. Though the slight look or surprise on the woman's face registers the idea of an ambush. So who was hunting whom? It would seem to me that she was hunting him, but then he lead her into an ambush. Who will win? One would like to think the female will, but her arrow is low and the undead monster is springing to the attack and his ax is ready to come around for a swing. Outside of magical assistance, it would seem the best hope for this woman ranger would be to leap away or to one side and then jump to her feet and run to gain distance for a proper shot with her last arrow. Wow. That's an awful lot of writing and thought about a piece of fantasy art. I could have gone on. Okay, I will. Just a little more. The above was my looking at this painting mostly as an individual work of art. When comparing it to other fantasy artwork, again, the realism strikes me. Because honestly, a lot of fantasy art isn't very realistic, even some of that by the better known artists. This particular piece of art seems real, not as if it could happen, but as if it has already happened and we are witnessing an image from the events. Another thing I truly love about this painting when compared to other fantasy art is it's simplicity in story; no multiple wizards fighting an army of dragons here! Alright. That's enough. I'm beginning to bore even myself. It's enough to say I love this piece of art. I believe I first ran across it in the late 1980s or early 1990s, and it seems it was somehow related to the Dungeons & Dragons game, but I'm not sure about that as I've not seen this piece of art on any of the covers of the gaming books. Perhaps it was a cover for Dragon magazine or an inside piece of art in one of the gaming books. Artist Daniel R. Horne has gone on to become known for his work in monster masks and sculpture, though it appears he still does some artwork from time to time. Over at paranormal romance author Zoe Winters' blog, there is a post about short stories and the e-book market. Basically, Zoe had an idea to digitally publish short stories every once in a while because she seemed to think it would keep her name out there and give her regular readers something to chew on between Zoe's longer projects. I thought it sounded like a decent idea, and it's one I've implemented somewhat. But then Zoe backed off. She decided the idea about short stories wasn't such a hot idea. You live and learn. Of late I mainly write epic fantasy, which tends to be action oriented, so for me writing a short story based in my fantasy world isn't that big a deal. For a paranormal romance writer, it's possibly a different situation. I don't know. And I'm not making any kind of judgments on Zoe's decision. Just outlining the bare basics of her post. One thing, however, that got Zoe to thinking about getting out more material was the fact that indie author Amanda Hocking publishes a new novel approximately every two months. But I have the same concerns as Zoe about wanting to give my readers a new "fix" on a fairly regular basis. To that end, I've decided what I'm going to do. I'm going to try to publish a novel every two months, at least for a while. Maybe I'll get tired of it, or maybe I'll find I just can't do it. But I'm going to try. I have a novella to finish up, but I'm hoping I can have the first draft done by the first of March. Then, I'll start my next novel, which is tentatively to be a Kron Darkbow novel titled "Ghosts of the Asylum," or it might be a fantasy novella tentatively titled "The Slave Pits of Mogus Potere." I've got a couple of weeks to make up my mind on which novel to write next. Staring March 1, I'm going to try to write 3,000 words a day every day. That means in a month I'll have 90,000 words, which is a fair length for a novel. That'll just be the first draft. At that point, April 1, I'm going to do one of two things. I'll either start sending out that novel to beta readers and doing some editing myself, or I'll go ahead and start the next novel. Why start the next novel? Because I generally like to put at least a month, preferably three to six between writing a first draft and the editing process, because this gives me a pair of fresh eyes on a project. I'm going to try this, at least for the next few projects. Whether I succeed or not, only time will tell. And I'm going to try to blog about this, possibly every day. Why? Because hopefully it will keep me motivated. I've even come up with a little chart allowing me to keep track of my daily progress. Each day is broken up into five sections, each section representing 600 words. So, at the end of the day if all five boxes are checked, that means I've got my 3,000 words for the day. I decided upon 600 words because it's an easy amount of writing for me to accomplish in a fairly short time. I'm hoping this will work. Notes: I've read a few of this classic horror writer's short stories in the past, but I'm not overly familiar with him. To correct that lack in my education, I spotted this short freebie e-book on Amazon recently and decided to give it a shot. Also, this short story was mentioned by name in a Ray Bradbury story I read recently, so that turned me towards this reading material. Really, this is more of a short story, but it came in e-book format, so I'm counting it as a book. Mini review: An excellent longer short story! Almost a novella. I've read that Lovecraft considered this his favorite short story, and it's no wonder why. Blackwood's tale here has a very Lovecraftian feel to it, and I'm not surprised it had a major influence upon Lovecraft the writer. Published in 1907, modern readers might find this tale a bit slow, as I did at first, but it does get going in an eerie fashion that is quite superb. Truly glad I read this one. Notes: I was not a big fan of Bradbury's The Martian Chronicles, but his Something Wicked This Way Comes is one of my favorite novels. So, I thought I'd give the author another chance. Just getting into this collection of short stories, so far I'm liking what I'm finding. Also, as with so many books, this one has a slightly interesting story about my finding of it. I was traveling in North Carolina and stopped in a small town's Amish grocery store to see what kind of goodies I could find. I was surprised to find a small used book store within the Amish store, but not so surprised that most of the books were either cook books or religious materials. However, there was a small section of other books, at that's where I found this one. Only cost me a couple of bucks, too, and apparently it was once a school library book, at least according to some markings on the inside of this small hardback. Mini review: Some great stories here. I liked it much more than The Martian Chronicles. Still, I believe Bradbury's short stories are best when sample only three or four at a time. A whole book of his stories tend to blur together in my mind, and don't quite have the whallop individual stories would. Somewhere online (I don't remember where) I ran across this made-up poster for the movie True Grit. Having just seen this movie a few days ago, I felt it appropriate. Oh, and my opinion on the film: It's a damn fine film. In general, it's better than the 1969 version starring John Wayne, though I personally believe Wayne pulled off the "fill your hands" scene better than Bridges. Sorry, Jeff. 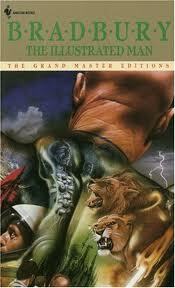 I also liked that the Coen brothers stuck much more with the novel, which I also recently read. However, a few changes they made in the middle of the film kind of left me curious as to what they were thinking ... they didn't hurt anything in the story, but I didn't really see where their changes added anything either other than some mild confusion on my part. The portrayal of the bad guys in this movie I found quite realistic and fascinating. This was a solid character drama, and one of the better Westerns since Eastwood's Unforgiven sort of said everything there needed saying about the Western as a film genre (which isn't necessarily true, but Hollywood seems to think so since they can't hardly ever turn out a decent Western any more). Mini review: An interesting look at the early days of whiskey making in the United States, but those who wish to study actual distilling processes should look elsewhere because though the author gets into some exactitudes, his writing style is not modern enough to easily make use of his directions. Notes: Editor, publisher and writer Dedman passed along to me a copy of one of his most recent novels, and I couldn't pass up the chance to read it. Jesse's works tend to be quite dark, which is fine because that's the sort of mood I've been looking for in my next fiction reads. Mini review: Sheesh, it took me long enough to read this one, but it's not the author's fault. I read this e-book on my computer, which I don't care much to do though I did it in this case. And then my computer had a major crash a while back, which didn't help. This e-book really put me in the mood to write something dark, and that's fine with me. The story here started off strong and then it weakened somewhat, though it gathered its strength again toward the end. Still, I felt the ending came a bit too quick for my liking, and would have preferred it to have been stretched out a little more with a little more meat to it; the final fight scene was over too quickly, in my opinion. SPOILER: My favorite aspect about this novel (really a collection of linked short stories) was the main character, Detective Michaels. In a world gone insane after apocalypse, Michaels might be the most insane of all. Literally. He sees people who aren't there. Are they dead spirits speaking to him? Or is he crazy? That's up to the reader to decide. But one of the interesting aspects of this story is trying to figure out what is real and what is just part of Michaels' imagination. You never can tell for sure.